Octopath Traveler is a complicated game with a lot of intricate mechanics. I’ve played many hours of it. Now it is time for me to share my knowledge with you. If you plan to play the Switch’s next big role-playing game, here are some useful tips. I’ve split this guide up into two sections—general tips and boss fight tips—so use them accordingly. You know, the obvious stuff. Save as often as possible. Heal up before boss battles. Check out the equipment store at every new town for weapon and armor upgrades. Talk to everyone. And so on, and so on. You can (and should) get all eight characters during a single playthrough of Octopath Traveler. You’re meant to do all of their stories in a single game. And although you’re locked into your main character until you’ve finished his or her story, you can play alongside whichever three others you want. You can also use the job system to customize your main character with whatever secondary class you want. Pick the character you know you want to stick with, but don’t stress the choice too much. Every character in the game has a useful skill that you can use outside of combat, and you should use them all as often as possible. Stealing is especially useful, as there’s no downside to it. If you fail to steal five times in a row, your “reputation” in a town will suffer, locking you out of all path actions in that town, but it doesn’t matter—all you have to do is go to a bar and pay a nominal fee and your rep will be wiped clean. So steal your heart out. At least one reviewer I spoke to didn’t realize that you can fast travel between cities on the world map. Don’t make the same mistake. You’ll save a lot of time, especially when you’re doing side quests. The priest Ophilia is usually pretty weak in combat, but if you remember to use her “Guide” path action to recruit NPCs and then summon them during battle, she can be far more effective. Summoning an NPC during combat is like getting a (temporary) fifth party member—it is essential, especially for bosses. It’s tempting to pick four good characters and just stick with them the whole game, but if you want to beat all eight stories, you’ll need to make sure all of your characters are up to speed. Why buy eight pieces of armor when you only need four? The game’s optional dungeons are often full of solid treasure, and grinding for levels (which you will likely have to do between new sets of chapters) feels more organic when you’ve got other goals to accomplish as you’re doing it. It’s tempting to skip these dungeons if you think you might have to revisit them later, but don’t worry—you won’t. 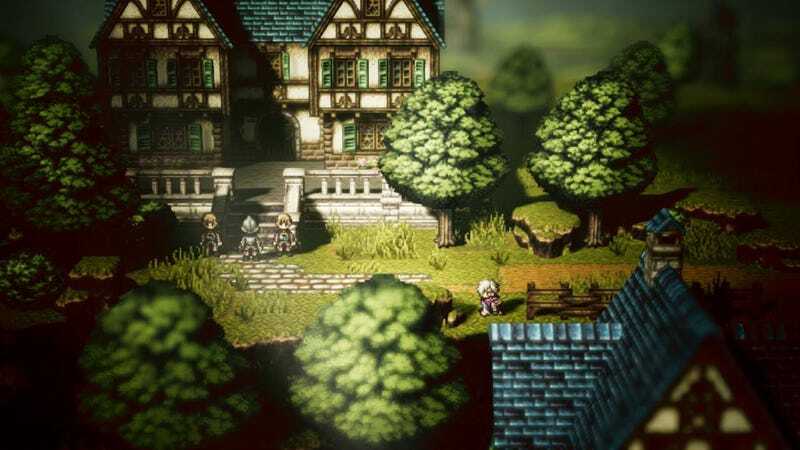 Story dungeons will always be connected to towns. Any dungeons you find regularly in the field will always be optional. The world map is sort of like an onion, with the innermost ring being the loop of cities where all the Chapter 1s take place. All eight job shrines are located in the ring surrounding that, where Chapter 2s and 3s unfold. You’ll want to get them ASAP so you can start customizing all of your characters. Once you’ve learned a support skill, you can equip it at any time, whether or not you’re still using that job. As you get toward the latter parts of the game and find yourself with JP surpluses on each character, rotate their jobs so they can learn as many support skills as possible. Money is scarce in the early days of Octopath Traveler, and big enemies can help you out with that. Using the merchant’s Collect ability on a boss can net you thousands or even tens of thousands of sweet sweet dollars. This might not be immediately obvious, but when you see an NPC blocking a doorway, that’s a challenge. You can use Olberic or H’aanit’s path actions to duel them and knock them out of the way, which often leads to good treasure. If you kill them before they run away, you’ll get a massive chunk of experience. Weapons will always be on the left, and spells will always be on the right, and they’ll always follow the same order (swords -> spears -> daggers -> axes -> bows -> staves -> fire -> ice -> lightning -> wind -> holy -> dark). As you’re trying to deduce an enemy’s weaknesses, keep that in mind. The key to beating boss battles in Octopath Traveler is rhythm. During the first few turns you should be setting up—figuring out a boss’s weaknesses, chipping away at their shield, debuffing them, and buffing your characters. Then, once you’ve knocked down the enemy’s shield, it’s time to unload. I’ve found that the most effective strategy is to pick one or two prime damage dealers and make your other characters support them. Olberic the knight is the best at doing massive amounts of damage (especially when you get his final skill), but you can use any character for this. It’s tempting to use your bonus actions to break a boss’s shield quickly, but that’s not quite as effective as saving up your BP to do as much damage as possible when their shield is already broken. You can also use your BP to extend the life of buffs and debuffs, which is extremely useful. When you knock down an enemy’s shield, they’ll be knocked out for two rounds: the current round and the next one. It doesn’t matter whether or not they’ve attacked in the current round. To maximize the efficiency of your shield breaks, you’ll want to knock down an enemy before they’ve attacked in the current round, so they lose two turns instead of just one. One way to do this is to use the defend command. When a character defends, they’ll get an earlier turn in the next round, so if you’re close to breaking a boss’s shield at the end of your current round, but they’ve already attacked, you should always defend. That way, you’ll break them on the next round and steal two of their turns instead of one. As you fight each boss, pay close attention to the turn order and plan out your attacks accordingly. Estimate in your head how many shield points you’ll be able to knock down in a given turn, and think of each boss as one big puzzle—how can you solve it as efficiently as possible? That’s the key to beating the toughest encounters in Octopath Traveler. We’ll be updating this post with more tips as time goes on. Published on Fri, 13 Jul 2018 20:07:58 GMT, © All rights reserved by the publisher.